Thank you – it’s basically what I already do, but I think I’m getting a little careless about how I pick up the wraps. 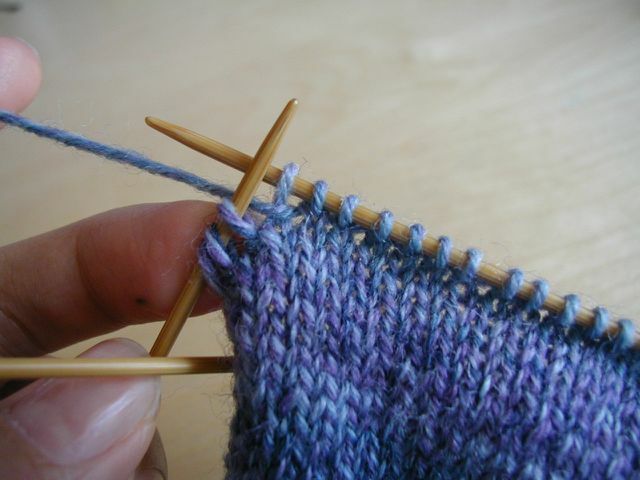 I have a toe-up sock on the needles right now, and I’m rapidly approaching the heel – I will definitely be referring to your tutorial. Thankyou! Very clear and easy to understand – I’ll give it a go on my next pair. Thank you so much for taking so many pictures. If only I had a sock ready to start the heel. ;) I think I will practice on a baby size sock. Thank you so much! I’m going to try it right NOW!! Haha. No, reallly. Thanks so much for the great tutorial. I do it the exact same way, except for the extra wrap to avoid a hole. That was going to be my question to you, since I always end up with a hole, but you’ve already answered it. I’ll be trying it out on my Soctoberfest socks. Thank you so much for doing this tutorial – I have printed it for future reference! Wow, thank you for this! 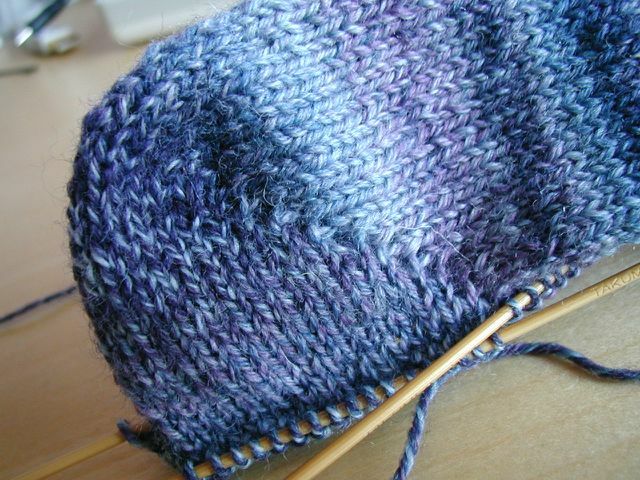 I’ve been wanting to try a short-row heel – I’ll cast on this evening. This will be so helpful! Great tutorial! I think I’ve figured out why my short-row heels always looked a little sloppy – so thanks for sharing! Oh wow, great tutorial! This is the best tutorial I’ve seen. I think lots of pictures are always the key. Luckily I learned short rows so i can knit Lizard Ridge from Knitty. 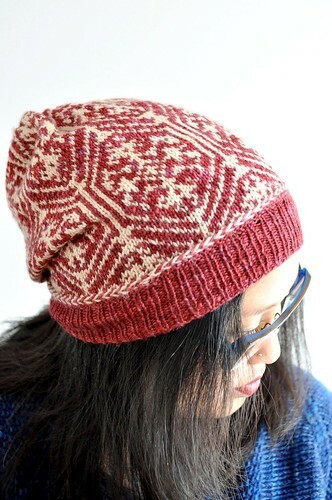 I will definitely post a link to this tutorial on the knitalong I started for Lizard Ridge. VERY nice tutorial. I love short row heels but hate, absolutely hate trying to pick up the wraps (especially on the purl side). I can never see them well enough, they always misbehave, and then I get frustrated (grin). Which, of course, is why I use YOs instead of wraps, but still . . . maybe I’ll try again now that I have all these nice pictures to work from…. 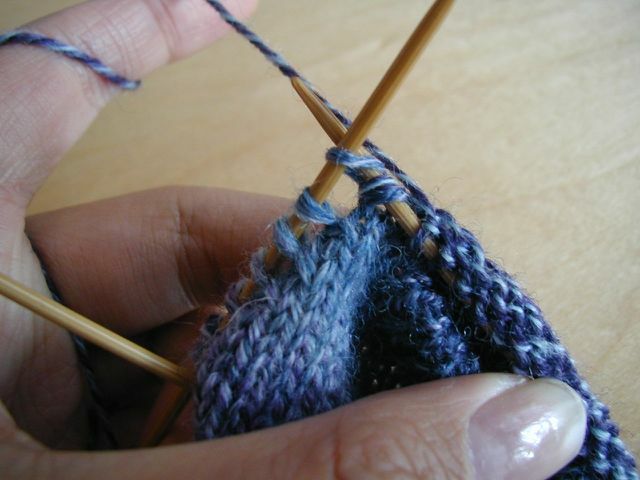 Wonderful tutorial–I can’t wait to start my next pair of socks. One question, and I feel silly, but am unsure. This is to be used only when doing toe up? Or can it also be used knitting cuff down? Great tutorial! I am knitting my first toe-up socks and am ready to start the heel. I was feeling a little lost but your tutorial has helped me gain some confidence. Thanx. Ooooh. That came in handy at just the right time. I just got some amazing sock yarn and was plotting to start working on them but was loaaaaaathing the heel flap. Much thanks! Thanks so much! I really appreciate it. It was MUCH easier to follow than the others. 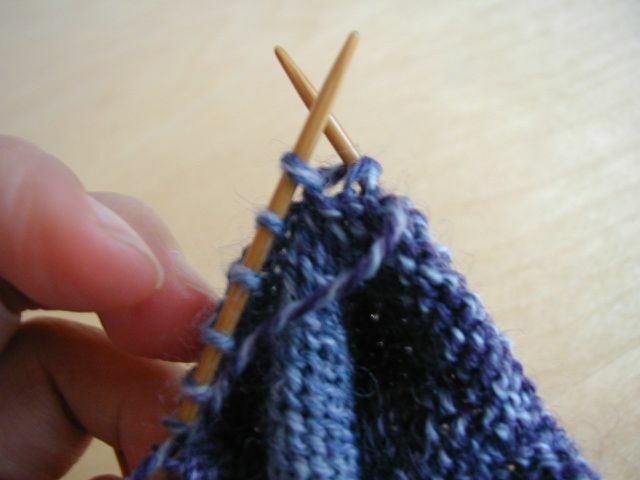 I’m just about to turn the heel on my first sock – good timing! Do you mind if I link to this entry for Socktoberfest tutorial? I know you are not participating, but you have shared some great information that I am sure would be helpful to many others. Please let me know – thanks! Thanks so much for this. You made it easy to understand. So clear, so easy to understand! Thank you. 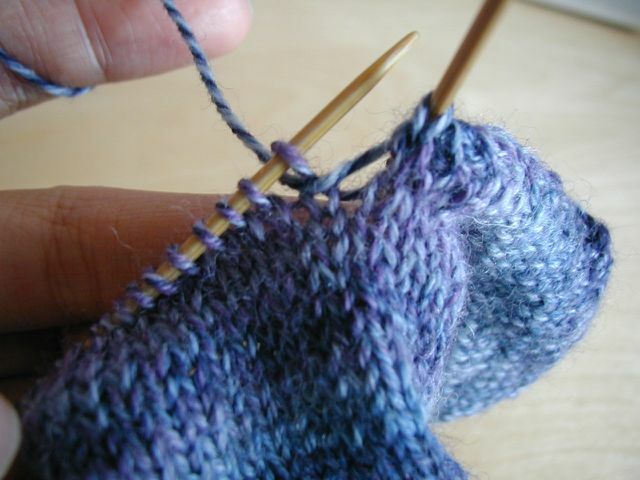 I’ve been knitting for a long time but never attempted socks, and now I feel that much closer to my first attempt. Thank you so much! Just for clarification . 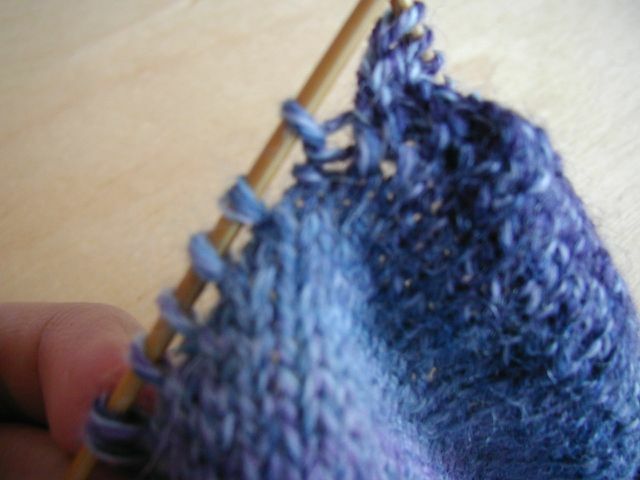 . . on the purl side, I need to turn it to the knit side to pick up the wraps? Thank you for this! I love toe up socks, but those stupid holes were getting to me. 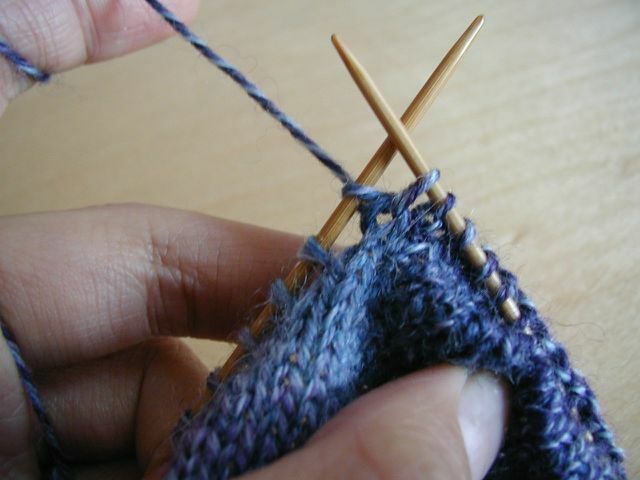 Next time I do one, I am going to try wrapping that extra stitch! Thanks for the tutorial! I’ve been looking for instructions for a short-row heel that I could actually understand (I can be very dim when it comes to following instructions!) and yours was perfect – my heel came out just right! Thanks again! Honest, I’ve seen surgeries that were simpler than what you’re demonstrating here. So I finally got a chance to use this, and it is incredibly helpful! Thank you so much. Will use on my 2 toe ups on one circ currently knitting. Thanks so much! 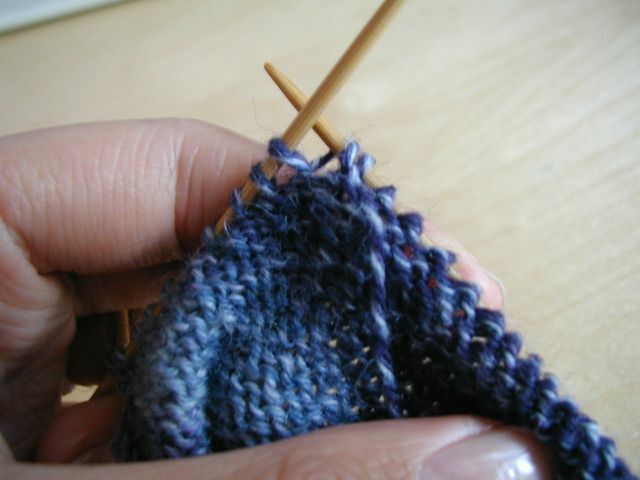 When I am trying out a technique—such as doing a heel, a neckline, a picked up sleeve in armhole, etc., I am too impatient to wait until I have knitted the entire item—so, I simply cast on (using invisible cast on, if applicable with “waste yarn”), then I “practice” whatever technique I am learning. I have a collection of different heels with the various instructions used for them in a “Project basket”. 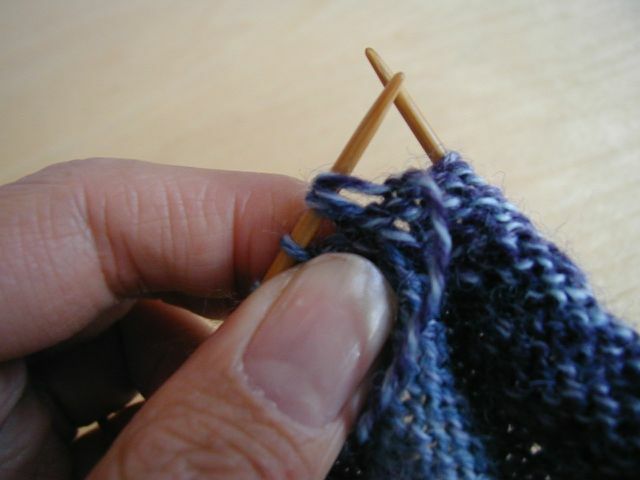 When I need to refer to doing a certain technique, I have the example at hand with the instuctions–the type of yarn used and the needle size. Thanks for this tutorial! I’ve only done heel flap so far and wanted to try short row heel for my current sock. I found this through Crafster. Thanks for the tutorial. It totally clears up my issues with short rows and short row heels. You are great! I keep reading the explanations for short row heels and they just aren’t clicking. I’d really like to sit with someone and work through it. I’d be more than willing to pay for the lesson. I live in Clayton, AL, which is half way between Dothan and Montgomery, also about the same distance from Columbus Ga. Is there anyone, or any shop out there that can provide instruction? Thanks for any help you can provide. And yes, I have knit lots of socks with the gusset heel, none with the short row heel. Thank you for the concise and clear tutorial. My very first heel looked clean and well done, and that after a long, suffering struggle with sock knitting in general! Thank you SOOOOOOOO much for this tutorial. After reading many different instructions and looking at many different pictures, yours is the first one that actually made sense. Thanks again for your clear and concise instructions!!!! 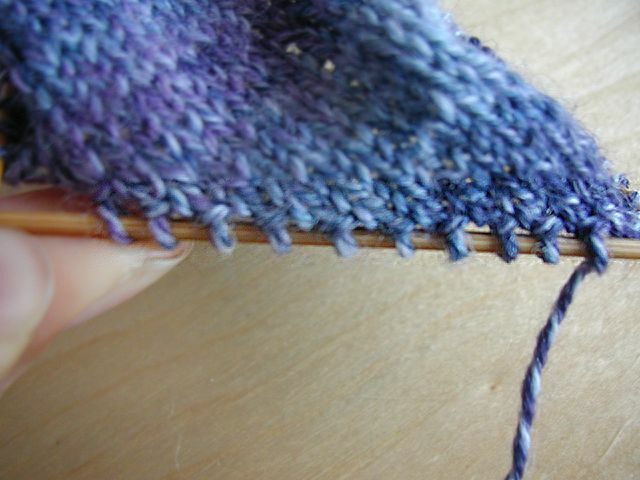 Is the end effect not the same as increasing a stitch purlwise, what you call “wrapping” a stitch when making a short row heel? I just made a pair of baby booties from the ankle on down, and they used a short row heel for that. I just didn’t get the whole wrapping thing, still don’t, but the way it was explained with the purlwise stitch increase it made sense and worked perfect. I will use this to finish up my toe up sock now that I found this method. Your tutorial totally rocks!! This is the first one I’ve seen (whether the others were in books or online) that has made complete sense. Your directions are clear and concise and the accompanying photos are picture-perfect! Thanks. Had to thank you for your short row tutorial. I have always wanted to do it but could never find an easy way to do it. I looked at a lot of sites and blogs yours was the best ever. Oh thanks, it’s been a mystery to me and my baggy heels. No longer – have just finished the snuggest fit ever, am now a convert to toe ups! Much appreciated. I love you. I literally love you for this tutorial. Me and my lizard ridge squares are actually proposing marriage to you now. Yay!!! I finally got the short row heel to work thanks to you. I’ve tried other websites, books and even sat down with a friend. I think I was also picking up the wrong side wraps wrong. It seems right to be wrong but it is right to be right even when you’re wrong. You are a miracle worker to be able to cut through the load of “logic” that I carry around. Thanks so much for this, with this tutorial, my third try at toe-up succeeded! This tutorial is grounds for a marriage proposal. I love you…I really love you! I have tried several methods of short row heels and after picking up my wraps, I can never make both sides of the heel look the same. One side (the purl side) looks really nice and the seam is close and finished looking. The other side (the knit side) always looks like it has holes in it. I don’t know what I’m doing wrong and it doesn’t make any difference which method I use, I always have the same result. If someone knows how to fix this problem, please advise. You’re a lifesaver! Thanks for helping me knock one of my New Year’s resolutions off the list! Many thanks for your graeat tutorial. All the photos are perfect to show how to. At last, short-row instructions that make sense to me. And just in time for the heels of my first toe-up socks. Muchas gracias! Thank you SO much for this! I actually used the tutorial on misocrafty because I was frankly a little intimidated by the knitting and purling of so many sts at the same time for my first short row heel. My first attempt had holes where the heel and instep rejoin and I was thinking maybe I ought to wrap the first instep st on each side and lo and behold – that is exactly what you recommended! Thank you for such a fabulous blog and wonderful tutorials! This may become my “heel of choice.” I’m very pleased with the results and your instructions were very clear. Many thanks. You have changed my life possibly more than electricity and vaccines. Thank you. Thanks for this. I am trying my first short row heel, and have tried two different sets of instructions, the ones from the pattern, and another set I found online. I couldn’t figure them out, and I have frogged TWICE. Your instructions are much clearer, and I shall try with a mini-sock. The photos make it clearer, and I can now see what I am trying to do. Thanks so much for posting this! I used it last night to make my first short-row heel. No holes! It was super easy too. Thanks again. Thanks for this great tutorial, very clear instructions! Hey, thank you so much for posting that tutorial ! I was searching for solution about the holes in the heel and I found your blog ! What lucky I am ! Bye ! THANKS!!! I was following a toeup sock pattern with a heel that made no sense to me, so I tried your heel here instead and it worked so much better for me. Thanks so much for such an awesome tutorial. 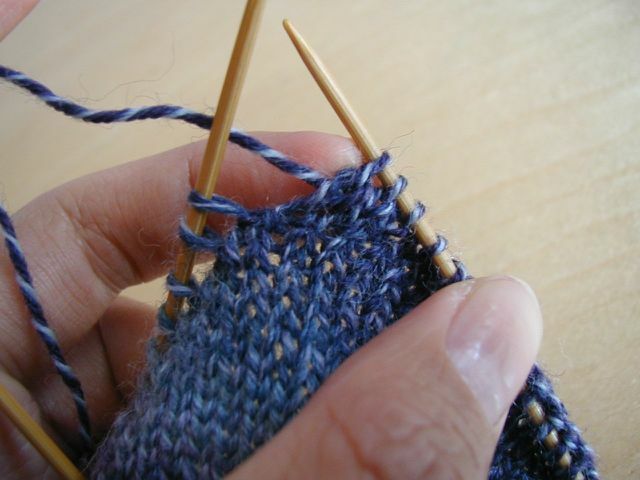 One more question… how can I know how many stitches do I need to do before I start doing the short rows? 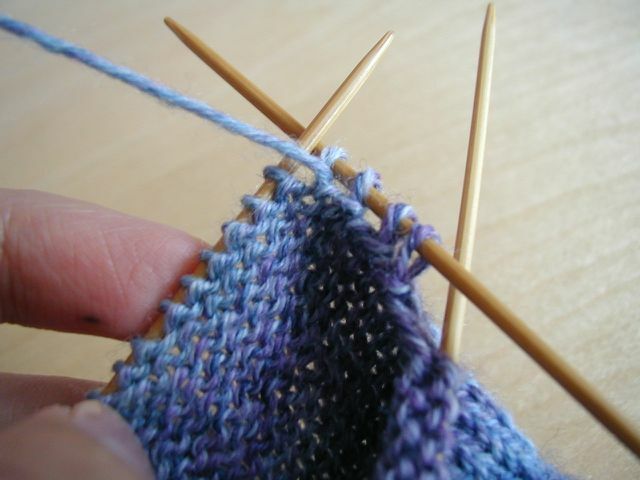 I am knitting a 54sts sock and I’ve gone as far as 28sts on each needle and after that I don’t know what to do! please help me! Great! I think I have it. The only problem I am having is on the purl side when I pick up the 2 wraps and the stitch, I can’t seem to be able to purl all 3 stitches together. Must be picking it up incorrectly. Thank you SO much for putting this tutorial together… I just finished the heel on my FIRST sock ever, using your instructions and having never done short rows before, and I’m thrilled with how it came out. This is the best tutorial I’ve found, and I looked all over. Awesome! Excellent work! I love it. I finally understand what to do with the wraps now! I have experimented, and now start socks toe up using the figure 8 cast on starting with 12 stitches each instep and sole, increasing to 64 around for me and 72 around for my daughter. 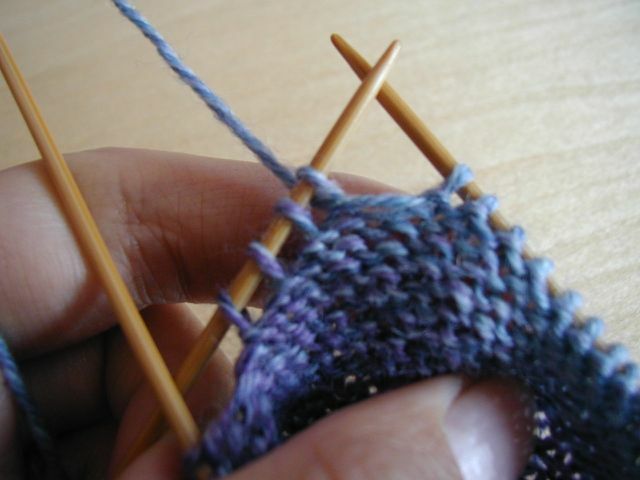 I use sock yarn and two size 1 16 inch circular needles to make both socks at the same time. 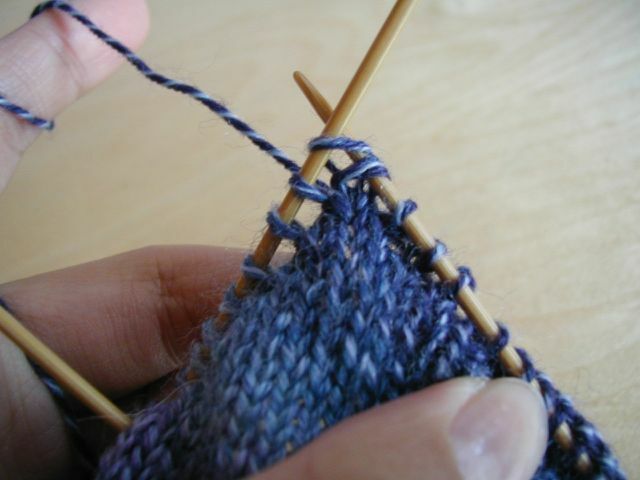 It is a bit tricky for the first couple of rows, then it is the easiest technique I have tried. I have been using the Sherman heel picking up with the encroachment technique. 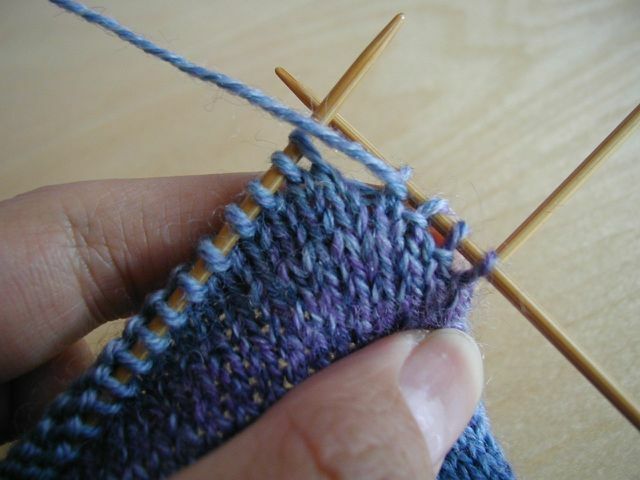 Your tutorial is so comprehensive and intriguing that I will use it on the socks I am making now with Paton’s stretch sock yarn. Thank you. Where I may to find blogs ln this topic? Thank you so much! I think I’ve got it! It’s been a few years since I made socks and the kid pattern I just started had this technique but no clear directions. I was so glad to find you and I have just finished my first heel, following along with this tutorial. 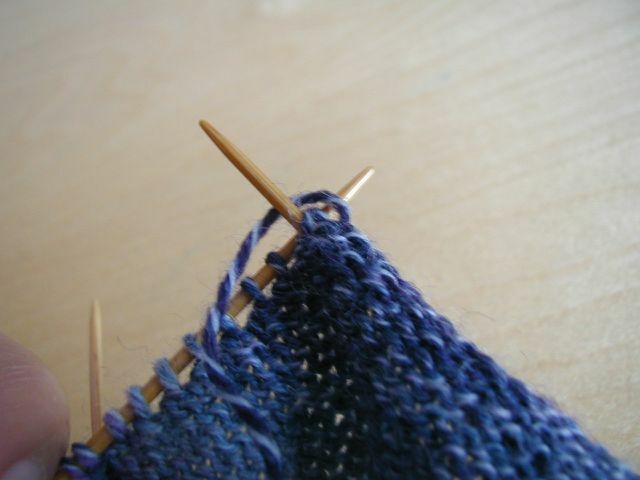 Thank you – so quick and a lot nicer looking than picking up stitches along the edge. 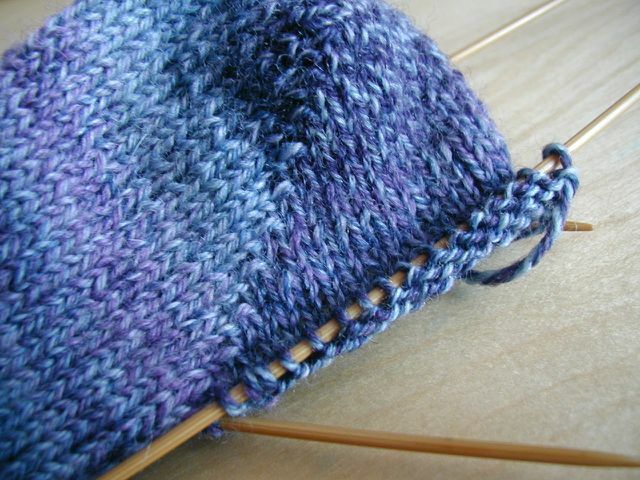 Thank you – just completed my first short row heel (of many more to come) thanks to your tutorial. I have been avoiding it – but wow, it’s much easier than I expected. I think I will be changing how I knit socks now! This was a great help for a beginner in sock knitting, thank you! I found the best thing to my boyfriend’s birthday… It’s really hard to find cool and still unique. I’ve been watching for a while but now i’m making my first post. I’m interested in getting some useful info, I hope this is the right place. So, I’m looking for some feedback about the forum from regulars. What are the cheapest web hosting company? I’m trying to set up a web site for my boss. I don’t always do short row heels, but when I do, I come to this blog post for instructions. Thank you! Hi guys one of my laptops just got infected with a bunch of really bad viruses, I have run clamwin but that didnt do anything, same with spybot, I am now running avast..
anyone here that can recommend the best virus program there is? At last, a tutorial I actually understand!! this has come out so neat I will be using it for all my socks in future, thankyou so much!! 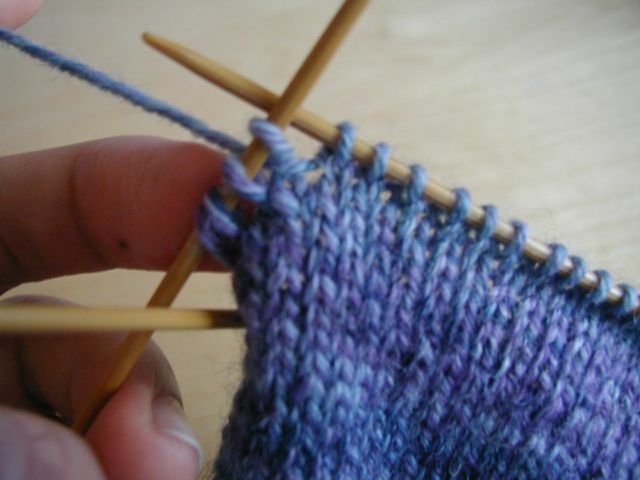 Thanks so much for the excellent tutorial :) :) :) knitting a short row heel is so much fun, I discovered! Excellent tutorial! I’m making my first toe-up socks (after 30+ pair of cuff-down) and when googling “wrap and turn heel instructions” came upon this. My first heel isn’t perfect, but does not have any holes. Thanks so much!! Thank you SO much!!! I wasn’t getting my purl side short rows to look right on my first ever toe up socks (with short row toe) and each side looked different. In theory the instructions sounded simple, but it wasn’t clicking until I read this tutorial. After ripping out 3 times I was about to give up on short row toes/heels and now I feel confident to try once more! So, thank you for that. I don’t care for the look of heel flap socks and didn’t really want to make them and be disappointed at the end of it all, now I don’t have to! Thanks for this very good explanation of the short row heel. 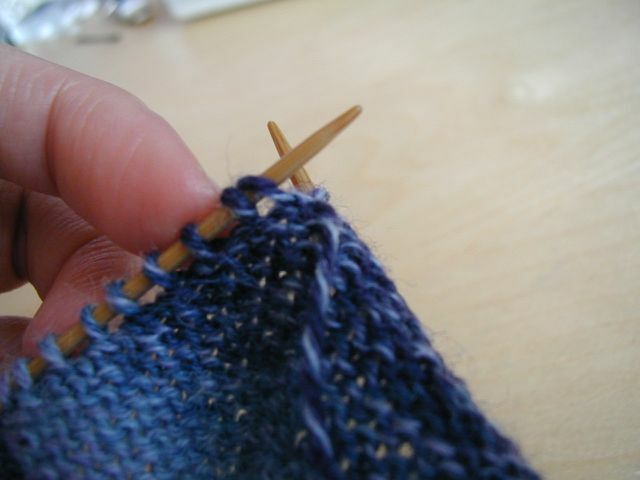 I’ve done it before, but always seemed to loose stitches along the way, and got holes in my heels. This is the first time it worked perfectly! I prefer the look of short row heels, but because of the holes I got, I didn’t use it a lot. But with this tutorial, from now on I’ll only knit short row heels. My computer worked not correctly, too much mistakes and buggs. Help me, please to fix errors on my computer. Thank you for taking the time to make this tutorial. The written directions I had were a little different, but mostly they were easy to misinterpret. I just remade my heel, and it looks much better! This is the easiest way to do a heel that I have ever seen. Great tutorial. Simple and easy to understand, plus it looks great when you’re done. I followed you instructions to a T and I am getting big honkin’ holes where I’m picking up the wraps. What am I doing wrong? Thanks for this excellent tutorial–by far the best method and step-by-step instructions I’ve been able to find for this type of heel! Oh, thank you thank you thank you, Laura!!! I was trying to follow instructions in a sock book, and was about to lose my mind. I thought I was going to have to stick with tube socks!! LOL!! I dropped a stitch when nearly done and had to rip it out to start over on the heel, but I did get the hang of it very easily and was thrilled with the result. I’m not scared of short-row heels anymore! YAAAY!! Now, I can get into REAL socks and just knit my little heart out! Thanks, again! 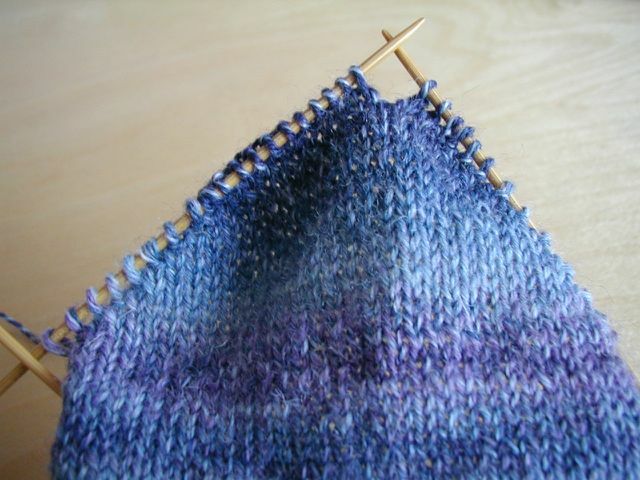 just got done with another short-row heel. thanks for the tutorial; i’d be lost without it! Just another comment to let you know how helpful this tutorial was! Thanks for your effort putting it together. Du stehst auf Kaviar, Squirting, oder einfach nur harte und geile Fickbilder? Wir bieten dir Private Amateure! Hier findest Du Pics, Pornofilme und Bumskontakte von und mit realen Privatamateuren. Es gibt inzwischen eine ganze Reihe Typen die es geil finden, wenn jemand Ihnen bei ihren Fickspielen zuschaut. Hier findest Du sie! Had a hard time understanding the pictures and wording is there a good video online that can teach the same method? Thank you so much, I think you finally solved my holey heels problem! Here’s it truly is obtainable in an exceedingly painless manner. This is likely to relieve your dirt so that as correctly for the reason that draw. Here can come the foremost imperative piece-servicing. This particular custom subject matter not only contains a awesome influence with wicking coldness lacking and assists you to steer clear of perspire with collecting when climate conditions could possibly get comfy. What’ vertisements more, ones own versatile rubberized bottoms can allow light and portable coziness the moment going for walks. thank you for a clear and concise (and illustrated!) tutorial for this heel technique! the pattern i am knitting now has a pretty unintelligible explanation of a 32-st short row heel:: your step-by step explanations make me feel stronger! It seems like you do extra rows. My book says to end when both of the last heel stitches are wrapped. This takes me to the end of a purl row. 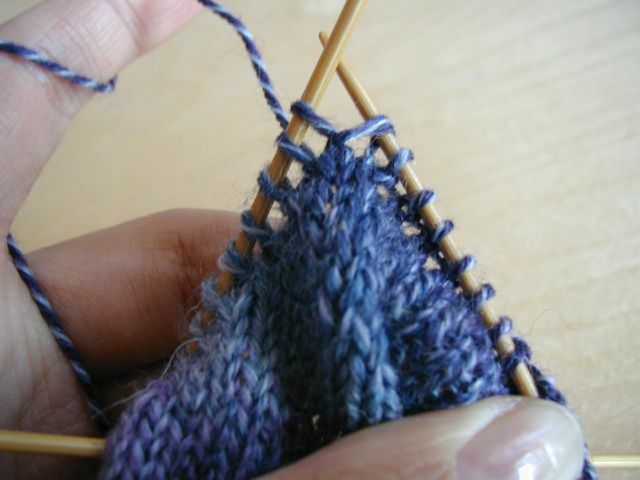 I then turn and knit back to the midway point of heel – end of round. I knit the other part of the heel and the two wraps at the last stitch and continue around the rest of the sock, making the foot. 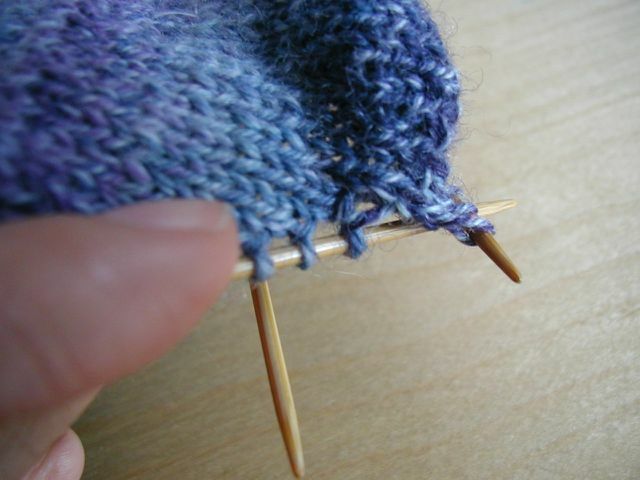 When I get to the heel stitches again there is a double wrapped stitch to knit. I could not work out at all how to add wraps for the instep stitches. If I have just wrapped and turned for the last time, I don’t get to go near that next stitch. Only if I knitted another 2 tows before joining. But doesn’t this give 2 extra rows of height before rejoining. I have to say how the book tells me worked ok. No holes. But I am curious about what you did as I don’t perhaps understand properly. I find that instructions for short row heels tend to taper off very abruptly so I was pleased there was an explanation to fall back on – I was trying to do yours in preference but then I gave up. Usually no one tells you when the heel stops and the foot starts. You do but I still don’t understand! Thank you so much for taking the time to take these photos and to write this tutorial. My first pair of toe up plain jane socks was a success and it’s all thanks to you! I dont see the photos either. I think it would help a lot especially to the part about the wrapped stitches and picking them up. Is there anywhere else these photos are published that we can see them? Thank you,Thank you. I just spent $75 on books to try and figure out the short-row heel and your explanation finally made sense.